DxO marking is BS.. Use your eyes and check these out. 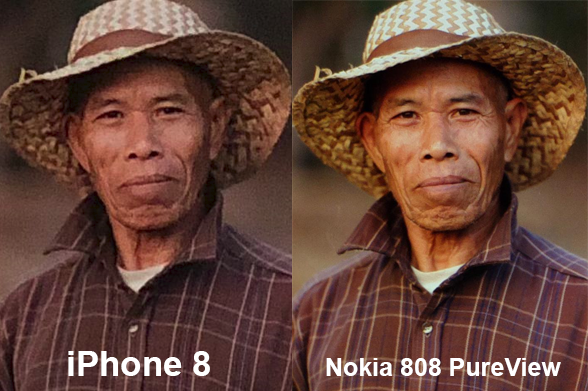 While clearly in all these samples Nokia 808 had better details and should be scored higher. Nick, 29 Mar 2018I agree with you, DxOMark lost all the credibility when they put Xperia Z5 and X Performance a... moreWell, With new rankings, their reputation went absolutely down the drain. They are on DisplayMate level now. This photo actually manages to capture every single bit of details without smudging them out... And of course this is with beauty mode off. Tann Hauser, 28 Mar 2018Dxo became fake marketing machine. Scores do not equate to real performance of cameras, and ar... moreI agree with you, DxOMark lost all the credibility when they put Xperia Z5 and X Performance above Galaxy S6, which obviously was a superior camera to both of them. After that their ranking method became a totally biased mess. Their new protocol seems to be slightly better but that doesn't really help to redeem their reputation in the past. There's no doubt that P20 Pro has one of the best camera in the smartphone market right now, but I'll wait for the real life picture samples from this phone with FINAL, retail software to see how it really performs in real-life conditions, compared to phones like S9+, U11+ etc. AnonD-625621, 29 Mar 2018This has 40mp at 1 om size pixels. 808 had 1.4 om.... this cannot beat 808... 808 is still the kingLack of image stabiliser and advanced processing like multi-frame NR or HDR can result in worse details and dynamic range in many situations, though. 808 is easily one of the best among all mobile phone camera if you're a type of person who always shoots images on tripod in raw format and edit them in Photoshop, but it is far from being great for just point-and-shoot purpose especially at night. Is Will gonna do it? AnonD-145316, 27 Mar 2018Exactly but still some young babies here won't understand that! One just needs to ask him/hers... moreHey Josh, Huawei unable to squezee the camera, no matter how big MP it is..
AnonD-743635, 27 Mar 2018And you stop saying capture "depth", what you are writing about is colour depth (bits) and acc... moreYou're talking about bigger sensor being better which is true do you not realize this is the biggest sensor on a smartphone right now. All other manufacturer have smaller sensors but they make it up by using computational software. AnonD-145316, 28 Mar 2018So what did you want dxo mark to do?? Put your scores and findings there?? Get a life Man! At ... moreDxo became fake marketing machine. Scores do not equate to real performance of cameras, and are released circumstantialy for product release, as it can be seen in this case. Simple as that. You are quite a rude fella. Tann Hauser, 28 Mar 2018You are sick? Im sorry, green tea may help. I just comment on what I am seeing by examinatio... moreSo what did you want dxo mark to do?? Put your scores and findings there?? Get a life Man! At least dxo mark is company which entails camera professionals who always test these devices? So what can you offer as an individual? Just too much talk behaving as if you have a idea about something but you just clueless!! You can go and train dxo mark employees on how to test cameras then. Or else shut up!! That night shot! Such controlled flare, good exposure, wow! Both images suffer from severe over processing and too much noise? DXO mark, is it just another overrated marketing trick? What's with the beauty mode being active in the DXO shots? The photos of the pixel and iphone show detail in the girl's face, but not on the huawei's, does DXO check the settings before comparing or they use the factory defaults or can't be turned off? Too much processing on too many camera sensors.